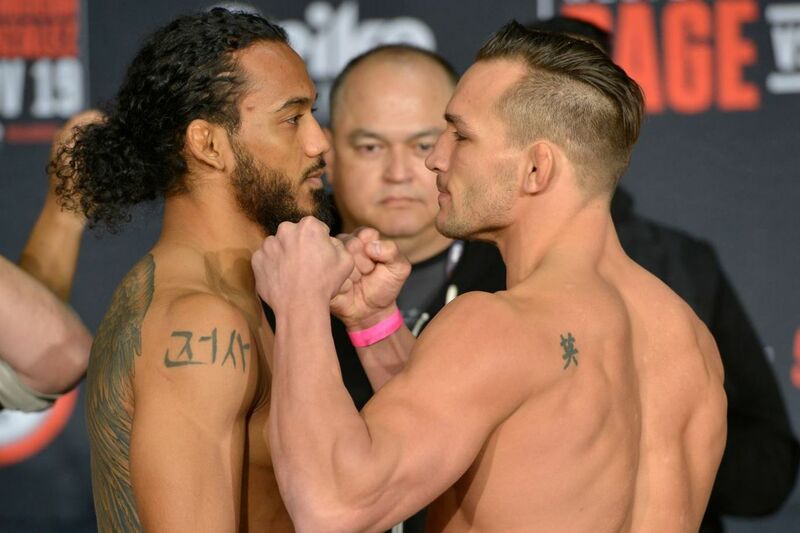 Bellator lightweight champion Michael Chandler and former UFC champion Benson Henderson led the disclosed payroll for Bellator 165, with both men cashing a flat $50,000 show purse for their electric headlining bout, according to information released Tuesday to MMA Fighting by the California State Athletic Commission. Chandler edged Henderson via split decision to win a thrilling back-and-forth affair and successfully retain his Bellator lightweight title. Neither Chandler nor Henderson were slated to receive a win bonus for the contest, thus both men ended up pocketing a $50,000 disclosed fee for their performance. The next-highest earner on the card was popular welterweight contender Michael Page, who cashed $40,000 for his listless decision victory over Fernando Gonzalez in the night’s co-main event. Notably, two other fighters other than Chandler and Henderson were scheduled to receive a flat show fee with no win bonus. Keri-Anne Taylor-Melendez, the wife of UFC lightweight Gilbert Melendez, earned an even $20,000 for her 47-second knockout over Sheila Padilla in her professional debut; while Kevin Ferguson Jr., the son of late Bellator star Kimbo Slice, earned a similar $6,000 flat fee in defeat for his debuting loss to Hamilton. Ferguson would not have earned a win bonus if he won. Bellator 165 took place Nov. 19 at the SAP Center in San Jose, Calif. The night’s main event aired live on Spike TV. A complete list of the Bellator 165 salaries can be seen below. As always, these figures do not represent a fighter’s total earnings, as certain contractual clauses and promotional bonuses are not publicly disclosed.